Scottish writer Iain Banks first appeared on the literary scene in 1984 with his novel The Wasp Factory. He went on to write 26 more books, often crossing genres to write science fiction under the name of Iain M. Banks. The Quarry is set in the north of England during the present day, as a group of friends gather at the house of Guy, who is dying of cancer. 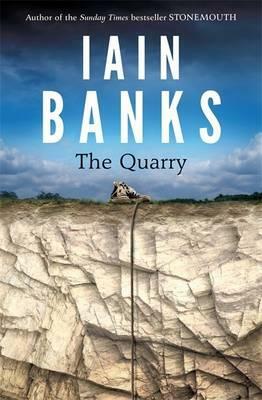 The Quarry is narrated by Kit, Guy’s son, who lives with and cares for his father. ‘Your average person has a pair of parents,’ Kit remarks in the opening paragraphs, and, as the story unfolds, we learn that Kit is neither average nor in possession of two parents. The identity of his mother preoccupies Kit greatly, and Guy uses this mystery to torment his son. Guy also takes perverse pleasure in torturing his friends, particularly rising Labour Party hero Paul, about the existence of a certain video they made in their student days. The friends search frantically for it, fearing the consequences should it be uncovered after Guy’s death. There is very little to like about most of the characters in The Quarry, several of whom seem to have barely matured since university. Kit is the most endearing, and it is his relationship with Holly, one of Guy’s friends, that makes for the most interesting reading. She is the closest thing that Kit has to a mother, and it is her advice and encouragement that ultimately help shape him. Banks announced in April this year that he was dying of gall bladder cancer, and his publishers brought forward the release date of The Quarry so that he might live to see it hit the shelves. Very sadly, the novelist passed away in early June, just days before the book’s release.